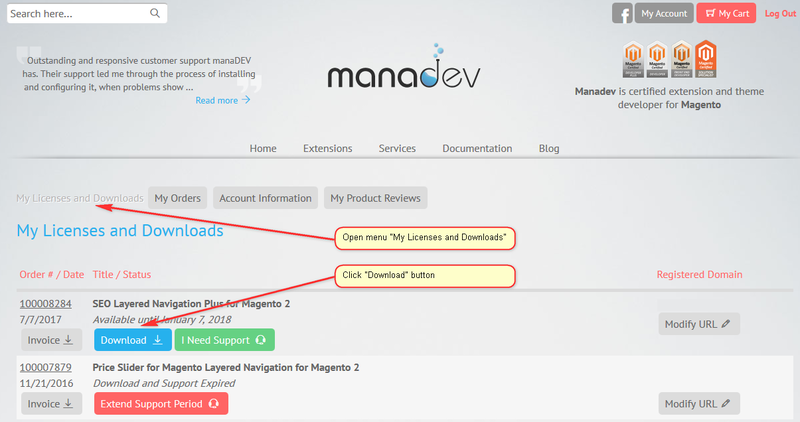 Download the latest version of the extension from your account on MANAdev.com. Make sure compilation is disabled in System->Tools->Compilation. Make sure the entire Magento cache is enabled using System->Cache Management (except 3rd party caches, FPC if you have it, also varnish – should be disabled). Upload all files of the extension to base (root) Magento catalog. It should be working now. Check to ensure MANAdev indexes run properly in System->Index management, re-index it if needed. The InnoDB storage engine for MySQL is a system requirement of Magento. If it's disabled, you should stop the installation. If InnoDB is enabled, it will show up in blue. Though this extension does not modify standard Magento files, we strongly recommend that you back up your Magento Installation before any extension installation or update. 3.1. Create full copy of your Magento directory. cp -R ../public_html/* ../public_html/.htaccess . One of the ways you can back up the database is to use command MySQLdump. To back up your database you need to know username, password, and database name. This information could be find in app/etc/local.xml. To be 100% safe during installation add this code with your IP to index.php just after <?php in the next line, it will put your store into maintenance mode. If you are using the Magento Compilation Feature, please go to Magento Admin Panel and open menu System -> Tools -> Compilation. If the compiler status is already Disabled, you are ready to go. If not, simply click the Disable button on the right hand side of the screen. Make sure entire cache is enabled. This can be done in Magento Admin Panel cache management page (menu System -> Cache Management). Select all disabled caches (except FPC or Varnish, if you have them, then both should be disabled), then click Enable from the drop-down menu, and submit the change. Open app/etc/local.xml file and check if there is some cache tag like one below or similar, remove it while installing. If you would like to install the extension directly to your computer, extract extension ZIP file directly to the directory where Magento is installed. If you would like to install the extension to your remotely hosted server, extract downloaded ZIP file in a temporary directory and upload all the extracted files to Magento root directory. Log into Magento Admin Panel. If you are already logged in, you need to log out and log in anew. Re-logging is needed to avoid 404 Error "Page not found". Open menu System -> Cache Management. In Cache Storage Management page select all cache types, choose Refresh from the drop-down menu, and submit the action. Disabled cache types do not need to be refreshed. Now, check if MANAdev indexes run properly in System -> Index management, re-index it if needed. If previously used, you can re-enable the Magento Compilation Feature byusing menu System -> Tools -> Compilation. Click Enable button and Run Compilation Process. If you have some old files that have been modified by copying to your theme, then new files should be copied to your theme and same modifications done. Remove added code from index.php. Do you have more questions? Please, feel free to Contact Us Today.